Shane (and his brother Clinton) grew up surrounded by family who were passionate about pyrotechnics and it is no surprise that this lifestyle became ingrained in both him and his brother. 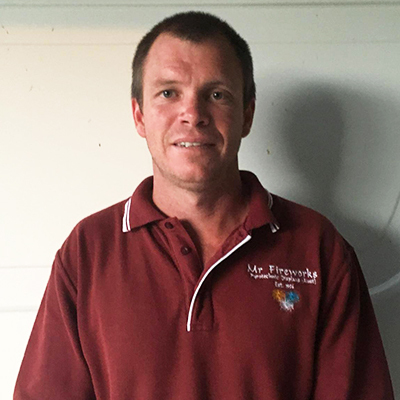 Shane began helping out with the family business when he was a 14 year old schoolboy, helping with packing cars and attending shows and functions. Shane became licensed at the legal age of 18 and spent weekends preparing and coordinating jobs for his parents, Gary and Sandra. Shane and his brother took over the family business in 2012. Shane has a daughter Peyton and is expecting his second child in October. Shane is an avid fisherman and enjoys surfing and camping. Clinton is the eldest Swanson brother. Clinton also spent his childhood days helping out with the family business. Clinton was licensed at the legal age of 18 and spent many weekends coordinating and performing fireworks displays. Clinton was fortunate to travel overseas with his grandfather to source new and innovative products and form professional relationships with fireworks producers, ensuring quality products. Clinton and his brother formed a successful partnership when they took over the business in 2012 and together the company and fireworks family is prospering. Clinton is also an avid fisherman and camper. 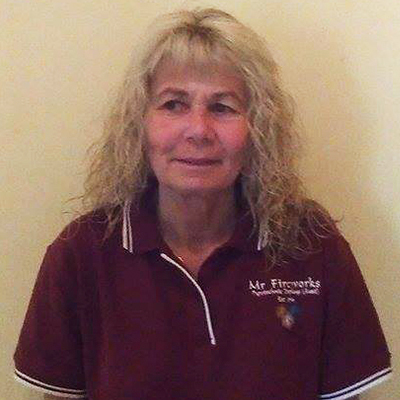 Gary and his wife Sandra are the 3rd generation of the Mr Fireworks Family. Gary worked with his father and mother from the age of 14. 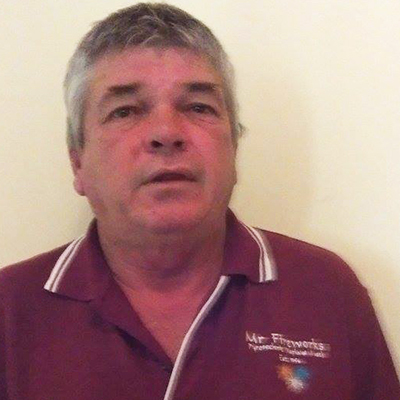 Gary was licensed in 1988 and has the honour of claiming the title of longest licensed pyrotechnician in Queensland. Gary has enjoyed the benefits of hard work and the business has flourished, at some points doing displays on a daily basis. Although the business was passed onto his sons in 2012, Gary still coordinates and executes displays for the company. Sandra started working for the family business in 1976 with her husband Gary. In a heavily male dominated workforce, it was an honour for her to become the first licensed female operator in 1988. Sandra has a passion for creating set pieces, logos and pyrotechnic artistry. Her and Gary won multiple awards for various displays and were the only fireworks company to take part in the Commonwealth Games in 1982. Sandra has passed on a wealth of knowledge and experience to her sons. Prior to taking over the family business, fireworks became a competitive industry with other companies establishing in Queensland. Gary and Sandra branched out into the overseas market, performing displays far and wide. They were involved in lucrative events, such as the opening of the Commonwealth Games in Brisbane in 1982 and the opening of the Performing Arts Complex by the Duke and Duchess of Kent in 1985. During this period, fireworks displays were in high demand and shows were being executed daily. Ian and Maureen continued the family business operating out of the back shed in Wynnum. All fireworks were hand fired and licensing was not compulsory. 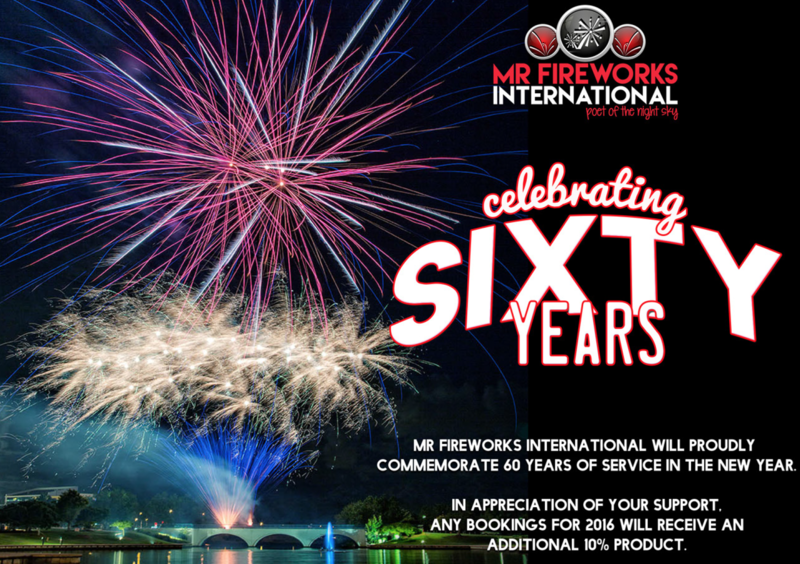 Mr Fireworks were the only Queensland company in operation and covered Tasmania, NSW, Northern Territory and Western Australia. Ian and family were the only company involved in the Commonwealth Games in Brisbane in 1982. He developed animations such as moving kangaroos and was the first person to hold an import license. Prior to World War 2, Andy Anderson, Maureen’s stepfather, started the fireworks business. 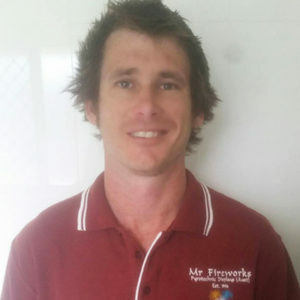 A special interest in pyrotechnics sparked the beginning of making his own fireworks in a backyard shed in Wynnum, Queensland. He would dismantle fireworks and fire their components in an effort to determine various elements. Andy served in World War 2, so the concept of a fireworks business was temporarilyy put on hold. Andy and his family performed displays for the Military Tattoos in Brisbane after the War. Andy continued to work until he fell ill in 1955. Camp Quality and Relay for Life (cancer fund raising events) Just two of the many non for profit fund-raising organisations that Mr Fireworks International sponsors annually. Mr Fireworks proudly presents hundreds of displays annually for Show Societies, Festivals, Corporate Events and Launches, Aboriginal and Torres Strait Islander Communities, Schools, Churches, Sporting Clubs, Councils, Concerts, Councilors, Weddings and private events all over Queensland, NSW and the Northern Territory.